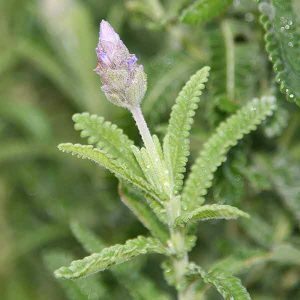 It can be confusing, however French Lavender usually means Lavendula dentata in todays terms. This is a drought tolerant, fragrant and easy care Lavender with dentate or ‘Toothlike Leaves’ the botanical name is apt. This is a Lavender well suited to Australian conditions. French Lavender comes in a number of varieties and can be used as a low hedging plant, grown in pots or in the garden border. This is a very long flowering type, drought tolerant, frost tolerant and easy care. Fragrance is best described as balsamic with a hint of rosemary. With its natural bushy habit, this is one of the best varieties for hedging. It is easily pruned to a neat and compact size. Flowering can be extended by deadheading regularly right through the flowering season. As the plant flowers continuously over a few month, you will need sacrifice a few flowers. We deadhead by using garden shears and pruning back to below the flower heads. As you prune back it will help the plant bush out, so deadhead by pruning back to 7cm (3 inches) below the top of foliage always leaving good green growth below. Lavender is not a plant that usually grows well in humid, sub tropical conditions. Lavendula dentata is one variety that is worth a try if you can provide good drainage and good air flow. The idea is to reduce the humidity as much as possible. Hill up the soil, and make sure the position is open. How to Grow French Lavender. A position in full sun is best, when planted in shade, Lavendula denata tends to flower poorly and will also grow towards the light, creating a badly shaped plant. You can grow French Lavender from seedlings or from cuttings. Cuttings are usually taken in spring. Height – To 1 metre. Spread – To 1 metre plus if left unpruned. Flowers – Mauve to Lavender from summer to autumn. White flowering forms are also available. Foliage – Bushy grey green foliage, linear leaves with ‘toothed’ (dentate) margins. Pruning – The best time to prune is in spring immediately after flowering. If you are growing the plants as a hedge, prune twice a year. Prune as much of the new growth back as possible without cutting into old wood. Planting Distance – For a hedge, plant French Lavender at between 25 and 30 cm apart. Ploughman Blue – Blue to Purple flowers, reaching around 1m to 1.2 m in height. Monet – Violet blue flowers on a plant that reaches around 70 cm in height. Pure Harmony – A white flowering form reaching around 1 m in height. var. Candicans – Tall growing to 1.5m, true lavender coloured flowers. Royal Crown – Long flowering with flowers held well above the foliage. Very popular type. French Lavender is available for sale from the following participating suppliers.